The human side of James Hector, the dominant scientist of nineteenth century New Zealand, long lay hidden in the illegible scrawl of Hector’s handwriting. Then Dr Simon Nathan began writing a biography of the man who established the museum that became Te Papa and the institute that became the Royal Society of New Zealand. In making sense of Hector, Simon has also illuminated New Zealand’s history. He will give a talk in Wellington on the day that would be Hector’s 183rd birthday. Here, he muses on perception, politics and science. You’ve now published transcriptions of many of the letters between Hector and his contemporaries. How did that come about? When I started writing the book about Hector I had worked out a plan and I’d written a couple of chapters. But I was quite dissatisfied with it because I felt that I hadn’t come up with anything new. One of the problems was that I hadn’t actually read anything written by Hector, because his handwriting is so very difficult to read. In the past people had tended to give up. I tackled a few letters myself and managed to slowly make sense of them but I realised that it was going to be very slow. Then I managed to get a research assistant, history graduate Rowan Burns, and working together we managed gradually to make sense of his letters. After a few weeks at it, Rowan could actually read Hector’s writing quite fluently. That was a complete change because we were suddenly hearing Hector’s own voice. In the past, things that had been written about him had been from secondary sources or official reports. You can really find out something about a person’s personality once you can read their own letters. How much of a difference does being able to read his letters make? You can see him as a human being. Hector had enormous energy and he had quite a wide vision – he’s the founder of most of New Zealand’s scientific organisations. He’s already been long viewed as a dynamic administrator but before you didn’t get an impression of him as a human being. Now we can see him having to deal with never having enough money, and his human conflicts with other scientists. I also think the breadth of Hector’s scientific work has tended to be overlooked. 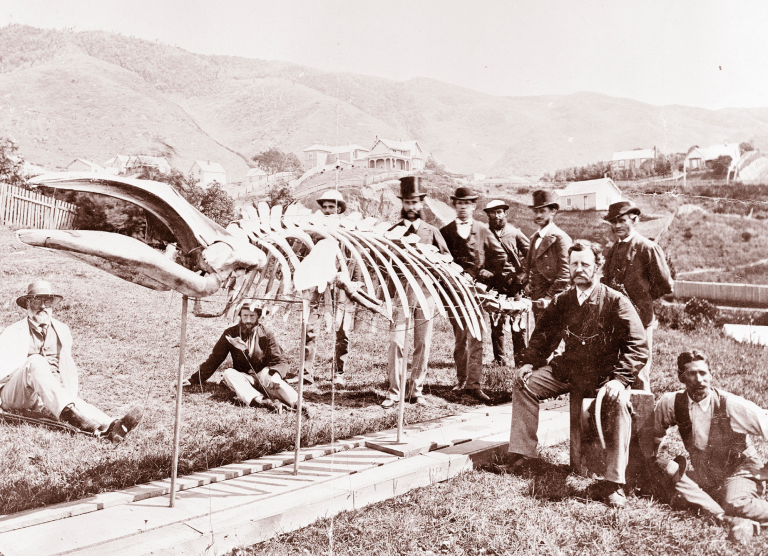 As well as carrying quite an administrative load, he was an active scientist describing animals and geology and taking an active part in the scientific exploration of New Zealand in the early days. He was the man who described Hector’s dolphin (thus it’s named after him), and was a very wide-ranging scientist. After all the effort of transcribing the letters, we collected them together as a series of volumes which are available on the web. One of my favorite collections was the correspondence in 1875-76 when Hector had a trip to England, and ran his organisations from the other side of the world. Do scientists today appreciate this historic perspective? I think that scientists generally want to be looking forwards, doing things that are new and innovative. ‘Backwards looking’ is rather a derogatory term in the scientific community. But science isn’t always about making new scientific discoveries. It’s about understanding the significance of what’s happened in the past and how that might impact on your ideas. There is an old saying that those who ignore the lessons of history are condemned to make the same mistakes again. That’s as true in science as it is anywhere else. This may not help push the frontiers of science, but it helps us understand the way in which people react to scientific discoveries. For example, there has often been scepticism about the validity of scientific results. You hear this particularly coming through today with President Trump and his followers, as well as many other people who have great doubts about scientific conclusions they don’t agree with. People tend to think this is something new. Of course it’s not. It has always been how science has been regarded, particularly if the conclusions from scientific research do not fit in with what politicians want to do. Were politicians and scientists closer in Hector’s day than today? Hector was always very well connected in political circles, and from the 1850s to 1880s most of the people in politics were relatively well-educated men who had at least a general idea of science. Then from the 1890s onwards New Zealand became more democratic, giving rise to people in politics who were less educated. Richard John Seddon, one of our most long-lived prime ministers who came to power in 1893, was a rather Trump-like figure. He was a great orator, he could catch imagination of people, he was highly opinionated, but he wasn’t always particularly well informed and didn’t want to hear opposing opinions. You probably know Hector better than anyone today. What would he have thought of having his birthday celebrated? I think he would probably be amazed. I don’t think Hector was a particularly modest person but he wasn’t a great self publicist either. He was the right man at the right time: had he been a generation later he wouldn’t have had the same opportunities. There was essentially a vacuum in New Zealand science when he was appointed in 1865 because that was just the point that the Government was moving from Auckland to Wellington. But it wasn’t just that, Hector wasn’t just a power grabber. From the point of view of the Royal Society of New Zealand (originally called the New Zealand Institute), Hector could see very clearly that there needed to be an organisation where scientists could meet and have information published. This was partly a reflection of his own experience. He had a year in London writing up the results of his Canadian exploration and he’d visited the scientific societies there. He could see that was needed here so he came up with what I think is a very interesting and somewhat evolved group of scientific organisations. In Britain everything tended to be focused on London. In New Zealand communications were poor and Hector realised right from the outset that if things were going to work they actually needed to have branches of the New Zealand Institute in each of the main centres. The second difference was that the New Zealand Institute was a good deal more democratic. The Royal Society in London was very much a gentleman’s club. You would be expected to have gone to a private school and probably Oxford and Cambridge before you would be considered for membership. In New Zealand there was no restriction who could belong to the New Zealand Institute as long as they could pay the subscription. Another thing which made it work wonderfully from the outset was their annual publication, the Transactions of the New Zealand Institute. Only members could publish in it, and it was quite competitive to get papers published in the Transactions. Also, every member in the provincial societies got a copy as part of their subscription. So the results of scientific investigations were read throughout the country and it was a matter of some prestige to have papers published there. That was quite a good fishhook to get members for the society. In many ways it was just what was needed in New Zealand for science at the time. Simon Nathan’s talk on Hector is at 6.00pm on Thursday 16 March 2017 at the Royal Society of New Zealand in Wellington. James Hector is the man seated in the feature image above. These interviews are supported by the Royal Society of New Zealand, which fosters science, technology and the humanities in New Zealand.